Fourth main entry in the bestselling FPS series created and developed by the EA DICE team. The solo campaign shows a vision of military conflict between the United States, Soviet Union, and China. The story takes place in 2020 on the territory of the People’s Republic of China. 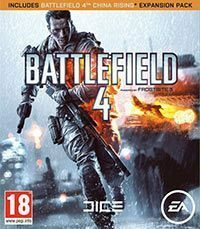 “Battlefield 4” is a first-person shooter developed by Swedish EA DICE. This studio brought previous installments of the “Battlefield” series and a few other titles (such as “Mirror's Edge” or “Pinball Dreams”). DICE is known for great games, but also for advanced graphics engines (Frostbite). The core feature of “Battlefield 4” is its multiplayer mode, but the game includes solo campaign as well. The action takes place in 2020. You play as Recke, a member of the U.S. special unit called Tombstone. Other members of the unit: Sergeant Dunn, a guy called Irish, medic Pac and Ruger. Irish is voiced by Michael K. Williams, i.e. Omar Little in “The Wire”. The campaign takes you to the People’s Republic of China. Your goal is to save a few VIPs kept in Shanghai. Due to some serious political friction between Russia, the United States and China, the task is not that easy and leads to a global conflict. The campaign includes several missions taking place in different locations. Developers have tried to diversify the gameplay by introducing missions with vehicles and dynamic scenes (e.g. running away from a helicopter). Players can choose their equipment and sometimes there are given the impression of having any freedom. In fact, the game is fairly linear and scripted. The only tactical element is a simple attack command given to your companions. In “Battlefield 4” there is no co-op mode – it did not work out in previous parts. Therefore, the developers decided to quit it and focus on creating a playable and challenging campaign and satisfactory multiplayer mode. One of the most important issues concerning the multiplayer mode is the return of a commander, who previously appeared in “Battlefield 2142”. The commander influences the action of his team by setting objectives and managing available resources. These include, i.e. vehicles and special prizes awarded for achievements gained during the game. Therefore, the commander can assist his colleagues with firing missiles. The commander’s gameplay resembles strategy game a bit. The commander has his own map enabling him to keep an eye on everything that is happening all over the battlefield. Therefore, tablets can be used to play “Battlefield 4”. The game offers three playable factions: the United States, Russia and China. Moreover, you can choose one of four character classes storm trooper, engineer, scout or support specialist. An engineer has a rocket launcher and mines making him irreplaceable during any fight where enemy vehicles occur. And there are a lot of enemy vehicles in “Battlefield 4”, from helicopters and airplanes to tanks and armored vehicles to boats. Moreover, you can freely modify them and improve their appearance by choosing the main and optional weapon and camouflage. The maps dimensions are similar to those included in previous installments. Moreover, you can destroy the scenery during the game. This provides even more tactical gameplay depth and dynamics. These features are additionally emphasized – 64 people can play at a time. Frostbite 3 graphics engine applied to “Battlefield 4” provides very precise graphics and realistic physics. The latter makes the trees swaying due to virtual wind or waves hitting the boat are very realistic. This affects the game itself – rough sea makes it difficult to aim and strong wind makes the exchange of fire at greater distances to be ineffective. Water simulation is a very interesting feature. Every water reservoir embraces the same physics applied to all participants. If one of the players stirs calm surface of the water, all of them will be affected. High waves allow for hiding from enemy fire, and fighting the strong currents reduce the maneuverability of vehicles. The most amazing feature of the Frostbite 3 engine is impressive scripted destructible environment. The levolution” effect is dynamic transformation of a map due to actions taken by the players. You can destroy a dam to flood the whole town and moving the fight on higher floors. This unofficial guide to Battlefield 4 is an all-you-need-to-know about the multiplayer mode, but also a complete walkthrough of the single player campaign.